Certificate of Discharge for Seaman discharge before the Superintendent of a Mercantile Marine Office in the United Kingdom, A British Consul., or a Shipping Officer in British Possession Abroad. 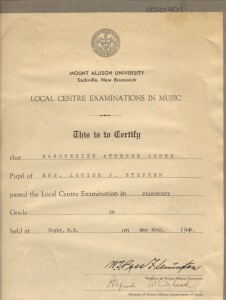 Ledger regarding the Estate of W.S. Gilpin, Esq., in acc’t with T.B. Gilpin regarding different property which was owned by the late W.S. Gilpin. First 13 pages in front of ledger. The back 2 pages of the ledger is a Legal Directory and Law in USA and Canada. Watercolour painting of a butterfly, most likely done by a young child, on the back of a letterhead for T. B. Gilpin, A.B., LL. B., (Yale) Advocate, Barrister and Solicitor-At-Law – Notary Public, Real Estate, Insurance, Express Money Order Agent, Conveyancer, Etc Box 8 Mail Office Digby, N.S. Canada. St. John Ambulance Association, the Canadian Branch. The Certificate in First Aid to the Injured is awarded to Aime Destobel, at New Waterford (Cape Breton). This file also contains a couple of photos, negatives, and numerous newspaper clippings regarding the Destobel/Cestnick family. 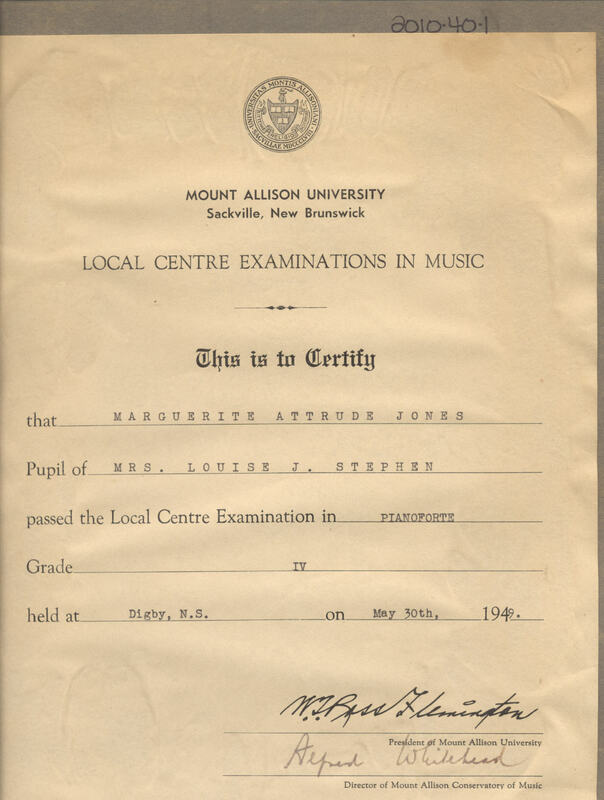 Certified to Marguerite Attrude Jones for Grade IV Pianoforte. This Family Register records the parents, William Titus and Mercy Crandall, along with their birth dates, marriage date, and the name of the individual who preformed the ceremony. There are 10 children and their birth dates recorded on this register along with some death dates.